Perfume is the perfect expression of metamorphosis; transforming exotic raw materials into captivating fragrances, it can remove you from the ordinary and transport you to the extraordinary. It is the ultimate personal luxury; perfume is sensual, beguiling, glamorous and expressive. It has the ability to retrieve deep memories, stir the soul and yet still remain an intrinsic part of our very selves. When Papillon was founded in 2011 it was our aim to create perfumes that are evocative and unique, using only the finest materials within the industry. Our compositions are produced using the classical methods, blended in small batches and are completely handcrafted. As a small artisanal company we are able to use rare and costly ingredients within all of our creations and have sourced these high grade absolutes and oils from every corner of the globe. Exquisitely composed, all of the perfumes in the collection are eau de parfum strength using a very high concentration of the pure extrait. All of our perfumes are androgynous as we believe there to be no gender boundaries when wearing a perfume. 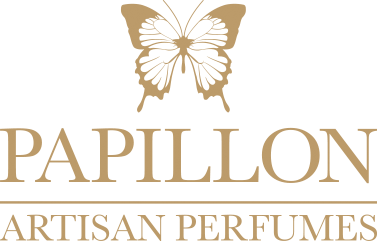 Papillon aim to continue the beauty and tradition of the ancient art of perfume making in the 21st century.